We are happy to showcase the products we manufacture for the lifting and the rigging industry and the related services we provide in the field of industrial inspections, testing, and trainings. Slingtek forms a part of a family owned business group having diversified interests in the field of investments, industrial trading, mechanical engineering and manufacturing over the past three decades in the Kingdom of Bahrain. With emphasis on manufacturing high quality products and meeting stringent safety standards, we are the first of its kind manufacturing facility in the Kingdom of Bahrain, serving various sectors such as oil and gas, construction, industrial, shipping, steel and offshore. We provide customized solutions to our clients in the field of lifting and rigging, height safety and fall protection systems. 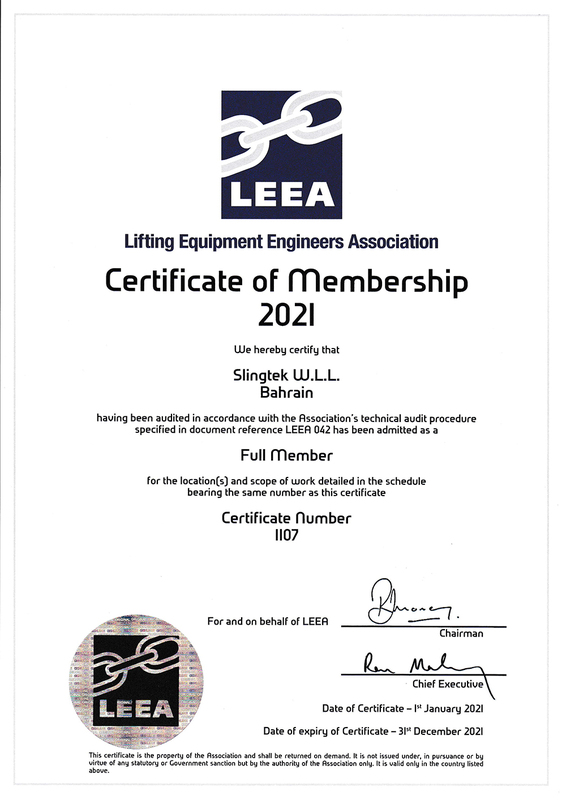 L.E.E.A: – The lifting Equipment Engineers Association is established across the globe as the leading representative body for all those involved in the lifting industry worldwide – We are Full Members of the association. We are proud to have upgraded our certification to the new ISO 9001:2015 which falls in line with our quality management systems and processes. Through this certification, Slingtek ensures its focus on Quality Awareness throughout its management and operations department. The lifting and the rigging industry is a very diversified work environment that demands highest safety during lifting operations due to high risks involved. That is exactly why we have maximum focus on safety and quality on every product that we manufacture. All products manufactured by Slingtek are certified, and meet all international standards. 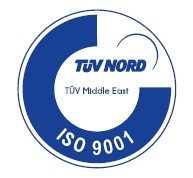 Being an ISO 9001:2015 certified company, all manufacturing processes are carefully monitored by stringent quality checks and controls and every batch of raw material is inspected and tested for any defects before being issued to production. 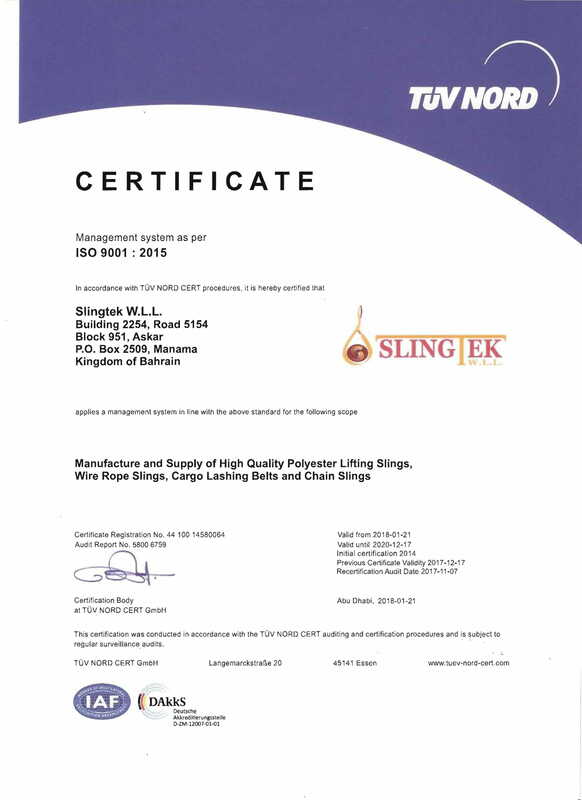 SLINGTEK W.L.L is committed to the manufacture & supply of textile lifting slings, wire rope slings, ratchet tie downs and chain slings in the Kingdom of Bahrain, to the complete satisfaction of each and every customer and thus achieve leadership in market as a reputed and reliable supplier. Achieving production commitments on time as well as satisfying customer requirements consistently and cost effectively. Promoting Quality Management System awareness and understanding throughout the organization in line with the goals and objectives of the organization. Continually improving our processes, products and services in a sustainable manner as well as utilizing best available manufacturing technologies. Adhering and complying with the discipline and standard with respect to ministerial regulations in a socially responsible manner. Communicating the policy to employees and other interested parties with emphasis on their individual QMS obligations, as well as providing training to our staff for improving their competency. Aim to enhance customer satisfaction by providing value added products and services. Although all our products meet the required international standards and follow strict quality control, we provide our clients an option of Third Party Inspections and Certifications. These can be arranged prior to shipments by any third party inspection agency chosen by client or us.